Welcome to TrygFonden Copenhagen Swim – a 2km open water swim through the canals of Copenhagen in Denmark. The event is held on a truly iconic course - around the Danish Parliament Buildings (Christiansborg). In Danish the swim is called ‘Christiansborg Rundt’ – to swim around Christiansborg. Drone and aerial filming has become very popular in recent years and this also reflect on swimming events. Strel Swimming, a professional swimming holiday operator, runs week-long guided trips in the Mediterranean countries (Croatia, Montenegro, Greece, Turkey, Slovenia). They swim from island to island, through the submarine tunnels and more. They have put together some amazing drone video clips from the past summer. See below youtube clips and enjoy! We must have made a strange sight: 12 wetsuited swimmers suddenly landing on a nudist beach. I often feel overdressed in a wetsuit, but this was ridiculous. But rather than disrobe and get into the swing of things, we averted our eyes, opened our towfloats and rehydrated with some water, before swimming off again on our exploration of the coastline. Most of you must remember the former Yugoslavia, at least from TV news. It was a union of 6 Republics formed into a Federation. Slovenia, Bosnia and Herzegovina, Croatia, Macedonia, Montenegro and Serbia (including the regions of Kosovo and Vojvodina). In the year of 1991 Croatia and Slovenia became the first republics to declare independence from Yugoslavia. During the recent Balkan war (1991-2001) many of these countries were not were appealing to visit, but times have changed now. Many call know these countries as the Balkans! Strel Swimming operates week long swimming trips in Southern Turkey. The warm and clear Mediterranean sea attracts many tourists and adventurers every year. Strel team will run two types of trip during May to October 2016. One trip is based in Kas where they swim daily from the hotel base to the surrounding islands over interesting sights, old shipwrecks, old city walls and in and out of Blue cave. “SwiminGreece is operating swimming holidays in locations of exceptional beauty in Greece. But SwiminGreece swimming holidays is also about exploring. Very calm and friendly vacations, swimming with all safety precautions adapted to each swimmer and addressed to different levels of swimming skills of the various participants, absolutely no competitive spirit, just for the fun of swimming, for exploring and also for relaxing and accompanying, for the non-swimmers. A time to relax, to discover, a time for yourself. An opportunity to meet new people, both the other participants and the members of the great team of SwiminGreece. At Strel Swimming Adventures they are deep into the swing of their season and they have already had several amazing swimming weeks in Turkey, Montenegro, Slovenia and Croatia. There's a new kid on the block, a lap-counting watch for swimmers that works in and out of the pool. Ever wanted to know how far you actually swam in that lake swim? How many calories did you burn? How many strokes did you take? Swimovate have just launched the PoolMate2, it features all the patented lap-counting technology of their existing models with the addition of an open water mode so you can track every swim, inside or out. Este sábado 27 de junio se ha celebrado la IV MARNATON eDreams Sant Feliu de Guíxols, la tercera prueba del calendario de retos en mar abierto de la IV Copa MARNATON eDreams. Con la incorporación de una nueva distancia, una travesía de 1,5km, esta edición ha incrementado su participación, dando cabida a un gran número de nadadores, más de 600, entre los cuales había muchos participantes amateurs. The female category features Núria Ciuró as the top finisher, Jimena Pérez and Lucrezia Casu from Italy in the second and third positions respectively. 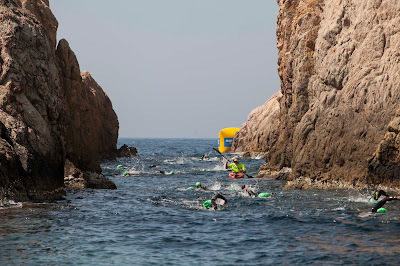 The second round of open water swim championship took place last Sunday in Palamós, gathering more than 550 swimmers from 17 different nationalities.